In order to succeed in e-commerce business, having a great website alone is not enough. It is important to have a shopping cart that is easy to use, a gorgeous layout, user-friendly navigation and enticing product descriptions. Having said that, if your competitors are using efficient digital marketing strategies to drive traffic to their sites and you are not then you are fighting a lost battle. There is a very good reason why businesses today optimize their sites and maintain their social media presence across multiple platforms. It is because these strategies work. To experience success in your e-commerce business, you need to have a robust digital marketing strategy. You need to make the best use of social media marketing, search engine optimization, email marketing, and pay-per-click advertising. According to Hubspot, through the aforementioned tools, digital marketing has brought about the exponential increment in traffic and value addition to global business. Simply put, if a business is not using digital marketing as an indispensable tool to market their products and services online, they are losing a growing number of online shoppers. Discussed below are some of the ways through which Digital Marketing tools can help in boosting online e-commerce business. When we talk about social media, we almost always think of Facebook as the sole platform to promote our products and services. This is not true. Besides Facebook, there are many other social media platforms which cater to a wide variety of audience as well as to niche groups. These platforms can prove to be very handy in attracting traffic depending upon the nature of the product or service that you are trying to sell and the type of customers that we are trying to entice. Facebook – undoubtedly it is the biggest and the most dominant social media platform today for a company looking for brand recognition. When used effectively, Facebook can boost one’s customer base in a large way. This is especially true for e-commerce businesses that are looking to improve their brand awareness. Instagram – If your business is heavily dependent upon visual aid to attract customers such as fashion, food etc., then Instagram is the perfect social media platform to explore. Businesses that use visual imagery to attract a large traffic of customers are increasingly using Instagram in a very big way to boost their top line. Pinterest – According to research, Pinterest attracts a large number of women visitors. Hence, companies dealing in women products such as jewellery etc. who are looking to attract female customers can use Pinterest to leverage their products or services. Google+ – Companies that are into the technological domain such as Cryptocurrency, Big Data, Cloud, AI etc. can use Google+ in a very effective way since it has a very large number of followers with a tech background. LinkedIn – LinkedIn is the ideal choice for businesses that are looking to indulge in B2B marketing. With the help of this platform, companies can reach out to other businesses to liaise with. Once you have got a new customer to buy a product from your online store or subscribe to free content from us, it is time to continuously engage the customer in the form of relevant content via email. If done properly, email marketing can yield the desired results. First and foremost, it has to be permission based. One should never spam the prospects or customers if they have asked not to be disturbed. When executing email marketing, this should always be rule number 1. Secondly, when emailing a prospect or consumer, you should always make sure that the email is contextual and relevant. Sending the customer an email that is relevant to the product that he or she bought or the original piece of information that the consumer was interested in has a higher chance of engagement than non-relevant content. For instance, if a consumer has bought a suit from an online clothing store and the merchant continuously keeps sending emails pertaining to child’s wear, those emails are very likely to go straight to the spam folder. When conducting email marketing, one should always use sophisticated email marketing software to segment the lists. This enables the sender to be contextual to the consumers to whom the emails are being sent. Also, when you personalize the messages that you send to the prospective buyers, there is always a higher chance of eliciting a response from the other end. When customers search for products online, they do not search for it at one place alone but at multiple places. The trick to get the customers to purchase products from you is to have your products enlisted in multiple places. Today, there are services that can help online retailers have their products displayed across important feeds. Two such services are Amazon and Google Shopping. Amazon provides some easy steps through which one can set up their products with the Amazon Marketplace easily and quickly. When online retailers set up their products on the Google shopping feed, they get help with their SEO efforts as well. Based on certain keywords to which the products may be relevant, Google will reward the retailers accordingly. Additionally, if someone is searching for a particular product that exactly matches your offering, your product may feature at the top of the Google shopping feed. 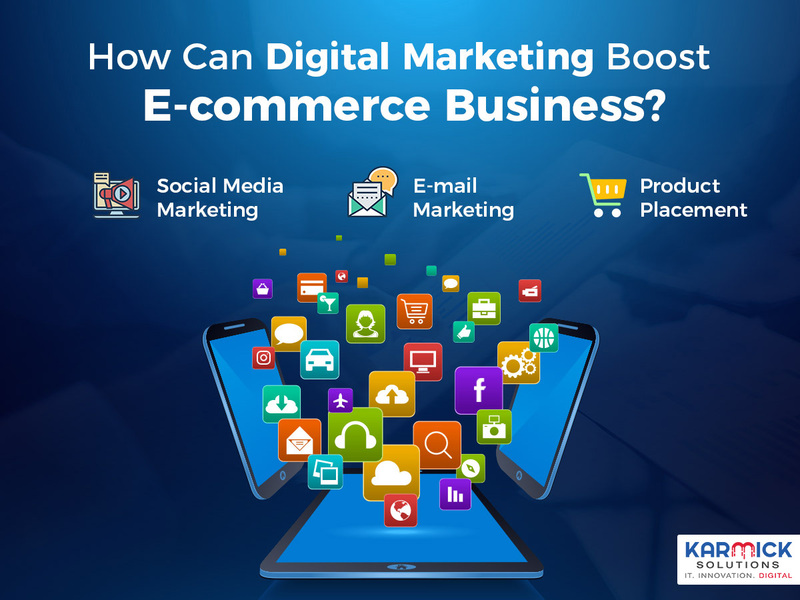 Over and above the aforementioned points of social media marketing, email marketing and product placement, there are many other ways in which digital marketing can boost e-commerce business. An integration of these various strategies into a coherent and efficient business approach can yield rich dividends for the top line of any organization.